Enjoy a leisurely stroll along the water's edge of Canal Saint-Martin. Linger over a coffee and a pastry in a nearby cafe. 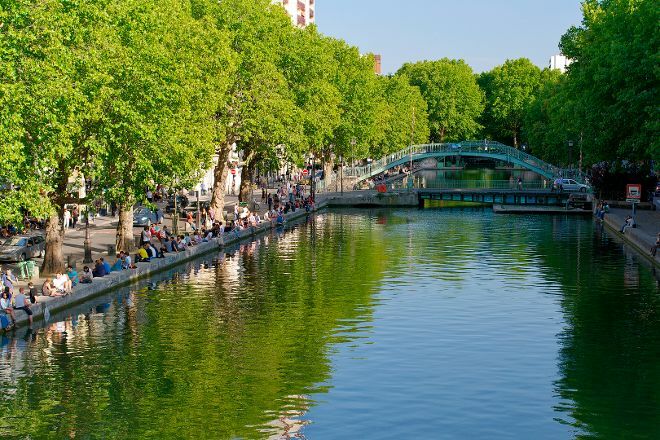 Take a look at our Paris road trip tool to schedule your visit to Canal Saint-Martin and learn about what else to see and do during your holiday. We decided on an annotated Boat trip on the Canal Saint-Martin instead of a Seine boat trip and it was great! First you glide underground through crystal clear Water and then it becomes even more exciting when you drive through the many spectacular Locks. I'd do this Boat trip over and over again, it's a very different Look at beautiful Paris! For my part, very nice promenade of the Canal St Martin in a scooter! I was able to go through this way to the Parc de la Vilette, you can enjoy places to picnic all along the Canal or relax. A lot of restaurants or bars, it's really nice especially when the sunny days arrive, the advantage is that there are very nice bike paths so to enjoy now the scooters to wander all along this channel.